Why are we the Cleveland area's go-to tree service company - let our past clients and reviews be the judge. We have excellent records with HomeAdvisor, Yelp, and Angie's List just to name a few. Further, we have the best staff and equipment in the industry. We take pride in our tree services and consider our client's satisfaction to be our #1 priority. Our clients will tell you that we are a service company that removes/trims trees. We are the tree service Cleveland are resident's trust and depend on. Our certified arborists have the knowledge and experience to understand what’s best for your trees, not just for the trees but also for your entire landscape. We exercise safety in everything we do to include our business practices: we are bonded, insured, licensed, and provide all our tree service professionals with worker’s compensation. In everything we do we demonstrate a commitment to our customers and employees. Our equipment is first-class. From our cranes, cherry pickers, bucket loaders to our chainsaws, all of our equipment is well maintained and clean. We can handle large, mature tree removal better than anyone in the eastern Cleveland area. And when our customers prefer that our heavy equipment not be used, due to potential landscape issues, our tree professionals can climb safely (using climbing harnesses) any and all trees to remove/trim them without ever needing our mechanical equipment. This provides our customer the alternatives in the way we provide our tree services. We have been serving Cleveland since 2001. We understand our customers have alternatives when it comes to tree services, to include those going door-to-door offering deals “since they are already in the neighborhood”. Please be aware many are not bonded, insured, licensed, or protect their workers with worker’s compensation policies. Trust us, as a homeowner or commercial property owner, you may be held legally and financially liable for tree service providers that do not afford these protections. Also, consider if other tree service providers will finance the tree service you require – we do, and please ask when you contact us. No matter what type of property you have (residential, commercial, investment property, etc.) you can trust us to provide you with the best service at a fair price. Customer service is our top priority and we promise we will never make any of the mistakes many of our competitors do, such as talk over your head; pressure you to buy; not return your calls; show up late for your quote or tree service appointment; be difficult to work with; and leave your yard a mess after we are done. No matter what tree service you require, no job is too small, too large, too easy, or too difficult for us. We have the right professionals and equipment for any and all jobs. Please consider Cleveland Tree next time you need tree care. Tree removal can be rather straightforward or a bit more complicated if nearby structures present a challenge. Regardless of the situation, you can trust us to plan and execute a removal strategy that is both effective and safe. The process begins with one of our tree service professionals coming to your Cleveland-area home or business to assess the project. At that time, we will provide you with a firm quote and set an appointment for the work to be completed. Our tree removal quote will include complete felling of the tree, assurance your yard and property will look as if we were never there, and stacking or removal of the wood depending on your preference. We will use our heavy equipment if there is no risk to your landscaping, otherwise we are happy to remove the tree the old-fashion way: climbing with a safety harness and removing branch-by-branch and then the trunk. During the entire job, we have a staff that will be removing debris from the property to our chipper, racking up even the smallest branches, and ensuring complete safety of all ground personnel. When we leave, the only thing you will notice is that you now have one less tree. Most trees could use a trimming, or at a minimum, pruning periodically. To maintain it’s symmetry, safety (relative to not overhanging property, such as homes and cars), and overall beauty most trees could benefit from regular maintenance. This process is overlooked by most owners yet we encourage you to consider our services in this area. Like our tree removal consultation, we will meet with you to discuss your objectives in trimming/pruning, make recommendations based on our experience, and agree to an approach. We will provide you with a firm quote and set an appointment for the work to be completed. Again, we will use our heavy equipment if no issues existing with other landscaping, or if not, we will trim/prune the old fashion way by climbing with a safety harness and trimming from the canopy. And again, with complete tree removal, we will have a ground crew to clean as we trim, remove branches and debris, stack wood or remove to a chipper, and ensure complete safety in our operations. When we are done, your tree(s) will have renewed beauty, be safe, and continue to add value to your landscape. And once again, your property will look as if we were never there, except for the now beautifully trimmed/pruned trees. Once we have your tree removed, we can optionally grind and remove the stump. Most tree stumps are eyesores and should be removed for landscape aesthetic purposes. More importantly, stumps can also be hazardous and often become home to unwanted termites and ants. Cleveland Tree Services has the stump grinding equipment to deal with any size tree stump. Whether we have removed your tree, or you just need an old stump removed, let us help. As with any job, we will come to your home or business to assess the work, provide a firm quote, and set an appointment to complete the job. We will leave the area as if there was never a tree there, and we offer additional services in grass seeding or sod laying to totally re-plant the area. Many think stump grinding is a commodity: anyone with a decent stump grinder can grind a stump. 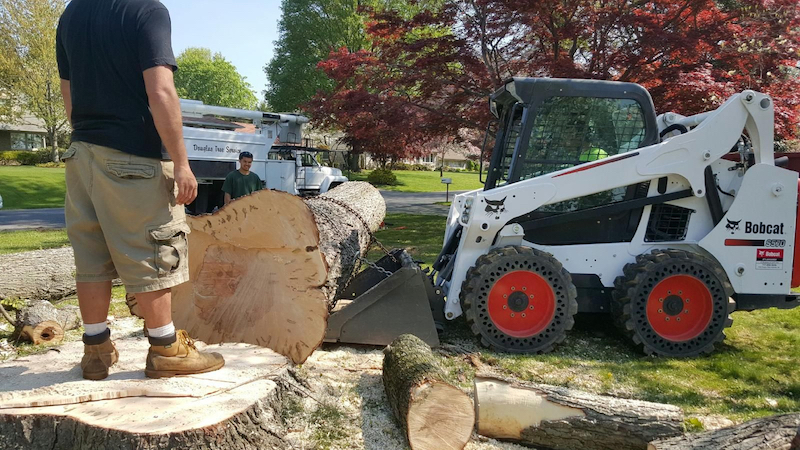 We have the knowledge and experience to not only grind tree stumps but totally clean and restore the area around the stump area. We will even re-purpose the wood and chips in environmentally green ways by using it as mulch and firewood. Stump grinding can be a messy, messy job – let us demonstrate how we can totally transform a tree stump area. 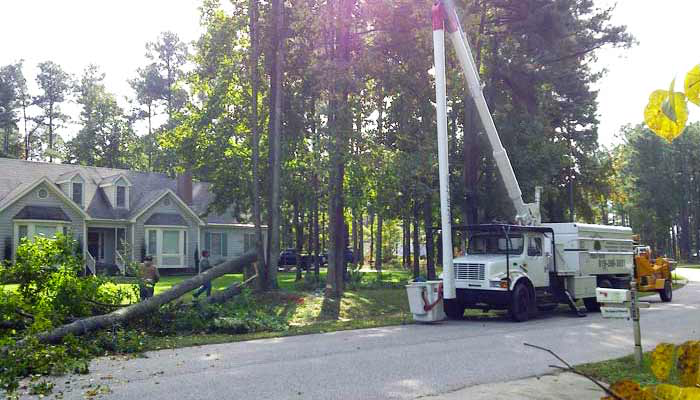 Our tree service professionals often work to restore owners’ properties to new again after large, damaging storms. We can deal with and remove all evidence of stormy weather, such as felled trees, large limbs, and other tree debris. We provide 24/7 emergency tree services to deal with storm damage and specialize in quick response and work hard to return your property to pre-storm condition. As a full-service tree company, we have the experience, equipment and staff to make quick work of the bad aftermath of strong storms. We are the tree service Cleveland citizens can depend on in times of emergency. As with most of the United States, the greater Cleveland area was a huge natural forest. We have been clearing lots for large residential and commercial developments, single residential lots, or just focused areas of lots, such as backyards or subsets of acreage since we were founded We approach these larger scale jobs just as we do single trees, with a plan and safety as our utmost priority. Because we have excellent heavy equipment, we can clear small or large lots very efficiently, saving our customer money vs small tree service operators. Please contact us for any and all lot clearing needs – we are the best choice for these larger-scale jobs. We offering wooding chipping services for customers needing small to medium sized limbs and branches disposed of. Our chippers can handle brush and up to 6" diameter limbs. We can haul the wood chips away or neatly pile them in your driveway or street curb. And of course, we always have plenty of well-seasoned firewood to sell. Please give us a call and we can arrange for delivery and stacking of as many cords of excellent burning firewood, as you need.